The little red train is slowly gliding up the side of the mountain. It’s not a long distance from Chamonix—only 3.2 miles—but the journey takes 20 minutes. Blame it on the nearly 3,000-foot ascent. From a wooden bench, you’re not focused on the rack railway in front of the train or the electric lines overhead. You’re staring out the window at the rocky Alps covered with snow. You can no longer see Mont Blanc, but other peaks—including Les Drus, Les Grandes Jorasses, and the Aiguille de Grépon—are added to the view with each corner the train rounds. Pretty soon, you’ll be able to see the Mer de Glace glacier, as well. 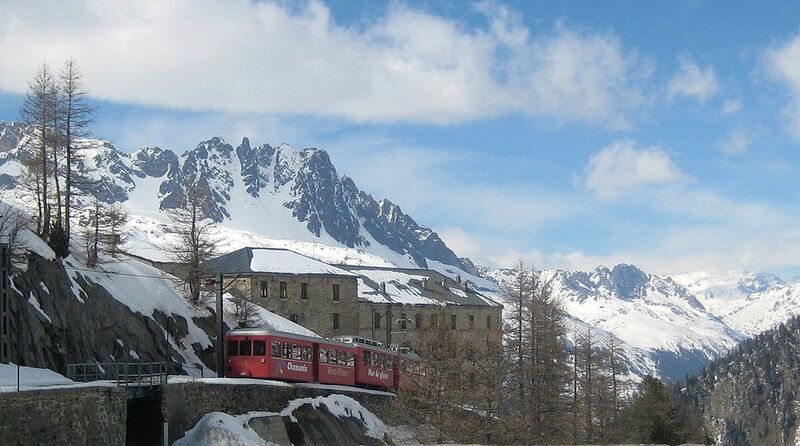 The Montenvers Railway is taking you up the side of the Aiguilles de Chamonix to Terminal Neige Refuge du Montenvers. For most people, this is a day trip. They ride the train, originally a steam engine when it was built in 1908, to stare at the glacier’s sea of ice. They descend into a man-made grotto to see ice sculptures and caves under the glacier. They have lunch on the outdoor terrace of Le Panoramique Mer de Glace. Then they return to Chamonix. You’re one of the lucky ones who gets to spend the night. Grand Hôtel du Montenvers was built in 1880 for mountaineers. After extensive renovations, the stone building reopened as Terminal Neige Refuge du Montenvers last spring. The hotel is still only accessible by train. It still offers breathtaking views of the Alps and the glacier. Plus traditional French cuisine is still served in the two restaurants. 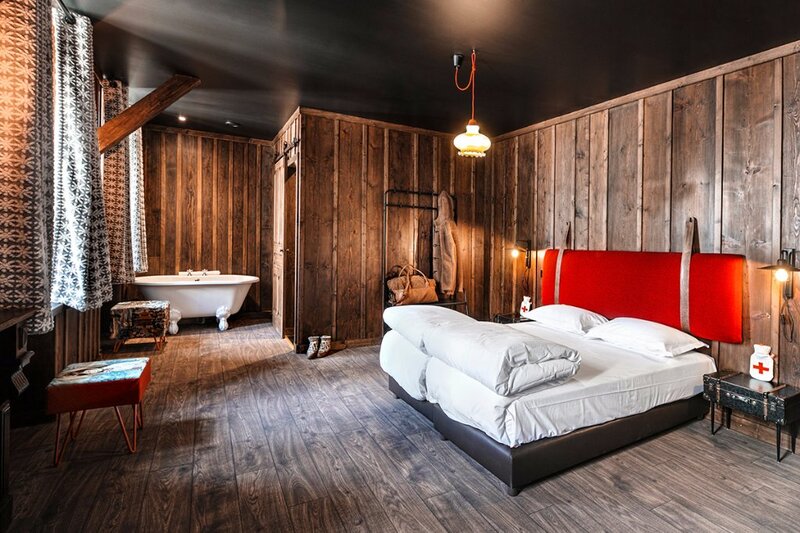 But the mountain hut now has a cozy, rustic-chic vibe. It’s the perfect escape from the hectic center of Chamonix. Chamonix has been on your mind because of the Olympics. The French town sits on the north side of Mont Blanc, the highest mountain in the Alps. Historically, the peak was part of Savoy, an area that now covers sections of France, Switzerland, and Italy. It became one of France’s first ski resorts in the 19th century. Then, in 1924, it hosted the first Winter Olympics. Sixteen countries participated in six sports during these games. Chamonix continues to be one of the most popular winter resorts in Europe to this day. So it’s a great place to watch the opening ceremony in PyeongChang, South Korea tomorrow night. After disembarking from the train, you separate from the other passengers and make your way to Terminal Neige Refuge du Montenvers. The inside of the hotel still has wood floors and paneling. Much of the original furniture has been preserved. Miners’ lamps and leather trunks contribute to the hipster vibe. While retro basins and faucets have been added to the bathrooms. With an exposed bathtub, your Altitude Suite has a romantic vibe. It has an open dresser and a thick duvet on the bed, as well. But it’s still the view that demands your attention. To kill two birds with one stone—your new obsession and hunger pains—you join the rest of the crowd at Le Panoramique Mer de Glace. The sunshine makes the temperature feel much warmer than the mid-20s, so you sit outside on the terrace. You look over the menu to find that les verrines are served in glass jars, les planches are set on slate, and les cocottes are cooked in cast-iron skillets. Blanc and rouge wine is poured from small pitchers. Plus you’ve already been warned not to skip the homemade ice cream for dessert. This certainly won’t be a quick lunch. It’s a good thing that you gave yourself plenty of time to settle in before the skiing events begin.